In 1902, when the Carlton Football Club appointed Jack Worrall as the first full-time coach of a VFL club, Fred Webber was one of 24 new players given an opportunity to prove their ability at senior level. A clever specialist small forward who was a reliable set-shot for goal, Webber became the Blues’ leading goal-kicker in his debut year, and stayed on at Princes Park for three seasons. Ten years after his last game, he won a Military Medal for bravery under fire in World War 1. 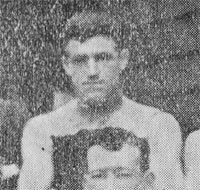 After joining the Blues from Carlton College as a 19 year-old, Webber had to wait until round 8, 1902 to be given an opportunity in the senior team at full-forward against Geelong at Corio Oval. Carlton had been beaten by the Pivotonians twelve times in succession up until that day, but after being given first use of a strong breeze, the Blues set up a handy lead and hung on to win by 4 points. Webber was one of eight individual goal-kickers. Fred played six more games that year, and finished-off impressively with seven goals in his last two matches to give him a modest total of 11 for the season – enough to make him the club’s leading scorer, but an indication of just how poorly the Blues were travelling. Webber’s second season was more productive, although injury brought it to a premature end. Thirteen games produced thirteen goals for Fred, while Worrall’s conditioning and discipline lifted his team into the finals at last. Carlton met Collingwood on the first of many memorable occasions in that year’s Semi Final, with the Magpies coming out on top by 4 points. Webber’s career tapered off after that, and he played only three more matches. It is unclear whether Fred fell out with the administration at Carlton in 1904, or simply decided to give football away – but while Worrall's search for talent continued, Webber’s career wound up with a hard-fought 6-point loss to Essendon at Princes Park. On the 27th September 1917, at Hooge near Ypres, the battery position was heavily shelled by the enemy, with conflagrations being caused in the gun pits. Immediately, these two NCOs rushed into the pits, and succeeded in extinguishing them after about 15 minutes’ work. They were under heavy hostile fire the whole time, and Lieutenant Beattie – who was assisting – was wounded. The utmost gallantry was displayed, and no regard to personal danger was paid throughout. Webber and McKenzie were both awarded the Military Medal for their exploits, and remarkably, survived the war without a scratch. John McKenzie (a farmer from Dimboola in northern Victoria) was eventually promoted to Lieutenant, while Fred Webber wound up a Sergeant. Webber was recommended for gallantry a second time in August 1918, when he was in charge of a column of supply wagons that came under concentrated enemy fire. The citation describes how his ‘energy and courage were instrumental in extricating the teams from an awkward situation, with minimal casualties.’ This time however, his recommendation was not rewarded. One of ten Blues to be decorated for bravery in the face of the enemy in the Great War, Fred Webber came home to Australia a few months after the bloodshed ended in November, 1918. Webber became a successful soldier settler farmer at Urangeline in NSW some time after 1920. He died in Urana, NSW on 7 September 1966 at the age of 83. Contributors to this page: WillowBlue , Bombasheldon , molsey , PatsFitztrick , tmd1 , Jarusa , true_blue24 and admin . Page last modified on Tuesday 08 of April, 2014 09:46:12 AEST by WillowBlue. 1999 Prelim - Whitnall's cool under pressure. 1993 - Barry Mitchell to go back to Swans? (18/08/93).